Vaasetter Hill, 110m, is the rounded light-coloured hill straight ahead. It is a very easy walk, though unfortunately I did not have time to climb it. Beyond Vaasetter Hill looms the dark summit of Sheep Rock (132m, and still just in square). Sheep Rock is accessible only to climbers capable at a high grade. It may not be very long before Sheep Rock becomes a separate island, as the link is very narrow and fragile. This won't make it any more difficult to climb, as the only practicable route is from the east. Although one can argue about "What is a hill? ", I think there are five hills of any significance on Fair Isle. 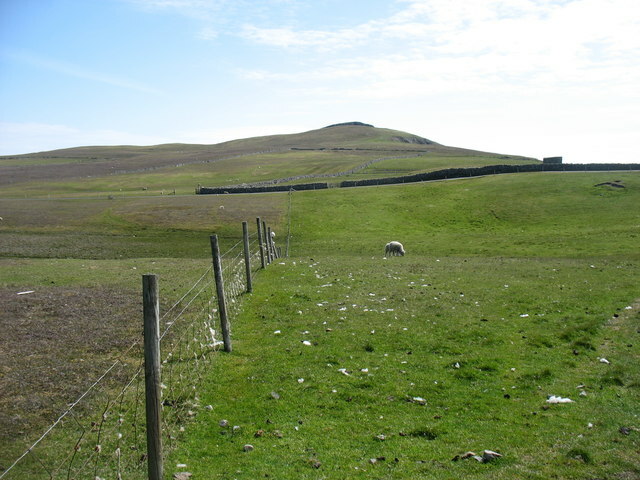 On this basis, Sheep Rock is the third highest and Vaasetter the fourth.